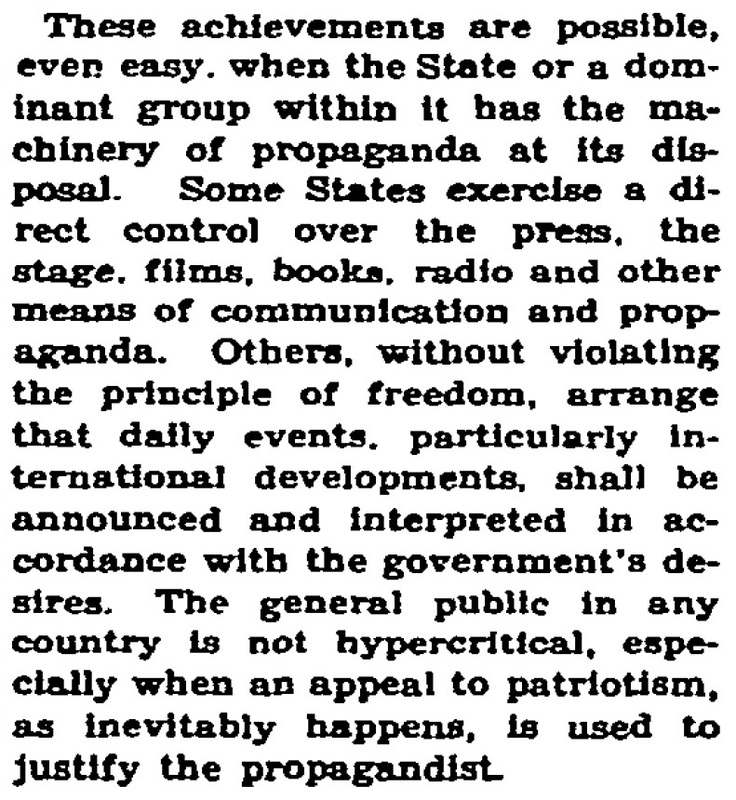 This article is part of a series of posts on how The New York Times covered the rise and fall of fascism in Europe. In these times of overwrought nationalism, when many states have inflicted a great deal of damage upon international commerce and thereby upon their own peoples whom they were striving to protect, there is in Europe at least one trade that has continued to flourish—that of national propaganda. Some of it is carried on by governments through authorized agencies, some by newspapers, news services, books, films, the wireless, the stage, the lecture platform. Much of it is quite frank and undisguised, though some of the means it employs—such as subsidies to the press and censorship of many varieties—are not flaunted before the public. The sincerity that inspires most of it need not be questioned. The propagandist normally is a man who loves his country with filial attachment and seeks to serve it with all his powers. If his devotion to the truth is on the whole slightly less unswerving than his devotion to his country, if in a tight place he is perhaps inclined to place the national interest somewhat above an academic respect for accuracy, that only reveals the intensity of his patriotism. The purposes of this propaganda are, broadly speaking, of two sorts, to unite the home population behind its policies, and to make a good impression abroad. These two aims inevitably conflict now and then, and it is when they conflict that the methods of propaganda, as distinct from straightforward information, are most clearly manifested. It is often a question simply of emphasis, one set of facts and views being stressed for the benefit of the domestic public, another set being disseminated for the enlightenment of foreign peoples; though occasionally the two versions of events and policy vary in more than mere emphasis and amount to contradictory accounts of what has happened. In the relatively few countries where a free and competent press exists—a press that is subject neither to political nor to economic control and is capable of presenting world news accurately and fully—the divergence between propaganda for home consumption and propaganda aimed at foreign opinion approaches the vanishing point. Such tactics are made almost futile by the simple fact that the domestic propaganda will be cabled abroad and the statements and suggestions put out for foreign ears will be cabled back to the country of their origin and published there. The government's own nationals are likely to learn within twenty-four hours what may be intended for foreigners, while foreigners within the same space of time will be made aware of the information being passed out to the domestic public. But in countries where the press is neither wholly free nor wholly competent—and this is the case in most Continental lands—the officially inspired or dictated information and views given out for domestic reading may differ from those designed for dissemination abroad. Some of what is published beyond the frontier may trickle back. An editor not bound to the government may like to embarrass it, or may have a professional prejudice against one-sided news; but if he is not restrained by his own patriotism he may be checked in other ways. Even if not checked, he usually does no great damage to the national cause; for few readers take the trouble to compare what the government says to its own press today with what it may have said to some foreign correspondent a month or a week ago, and a loyal public firmly believing in its leaders will stand for a great deal without becoming inconveniently critical. Moreover, very few Continental readers have any conception of what an adequate presentation of news is, and they do not expect it. There is hardly a Continental newspaper that makes any pretension to a daily survey of the world in the comprehensive and objective manner of the best newspapers in English-speaking countries. For one thing, the papers cannot afford it and are not organized for it. For another, they are on the whole less concerned with giving their readers a full supply of facts than with giving them daily advice as to what to think about their government and those of foreign countries. They publish long, and often learned, editorial articles and very brief news dispatches. They often represent a political or economic group and view the daily procession of events from the standpoint of that group. In elections or other political contests they take no trouble to tell what their opponents are doing or saying, excepting when such news seems to serve their side. Thus they readily lend themselves to propaganda. They are, indeed, almost constantly engaged in it. To them propaganda is at least as important news, when not more important. When it comes to national propaganda, as distinct from party propaganda, they need no urging. When a dominant party fails to convince the whole country that its aims are eminently national and must be supported by all patriots, there is in most countries the censorship to fall back upon. This is notably the case in Germany, where democratic governments did not repeal the censorship powers inherited from pre-war days and did not hesitate to use them and even to enlarge them. The Germans gained the reputation during the war of being indefatigable if not always adroit propagandists. When they undertook propaganda they carried it on, as they do most things, in a thorough manner. In France today they are admired and envied for their propagandist talents, many Frenchmen being prone to explain any foreign coolness toward French policies by reference to the competence of German propaganda. Many German newspapers, particularly those in border areas of mixed population, are subsidized by the State. The Prussian budget for 1930 allotted 1,193,013 marks to the support of chosen newspapers. This was justified on the ground that it served to maintain and further German culture in places where it needed help. Thus German newspapers, if they behave properly in the eyes of authorities, may receive financial support from the public treasury, and if they behave otherwise they may be suppressed. The moderate Chancellor, Dr. Bruening, was quick to suppress newspapers that he deemed embarrassing to the State, and during the later months of his government the Nazi press did not know from one week to the next whether it could continue publication. Papers were forbidden to appear for days or weeks at a time. This did not, however, prevent the growth of the Nazi movement. Nevertheless, the Nazis, when they came to power, applied the same methods. But they applied them, of course, to a different set of newspapers. The Nazi press then became a pillar of the State and enjoyed full freedom, however violent it might become; while the Communist, Socialist and even the Catholic press was regarded as unpatriotic and subversive, and was suppressed whenever it published something offensive to a Nazi official. A naval war film was recently shown in Germany as part of the general military propaganda. In it the Germans were made very chivalrous, the British treacherous. Herr Hitler, Herr von Papen and Herr Hugenberg, all members of the Cabinet, honored the first showing of the film with their presence. This fact was cabled abroad. A few days later Herr Hitler's press agent, in order to reassure British opinion, asked a British correspondent to state that Hitler did not approve of the film. This statement was published in England, whence it was telegraphed back to Germany. Thereupon the German Government press bureau issued a statement saying Hitler had not authorized anyone to say he disapproved of the film—which had been made by a firm owned by Herr Hugenberg, Hitler's Cabinet colleague. Here was a case where propaganda meant for consumption abroad proved embarrassing at home. 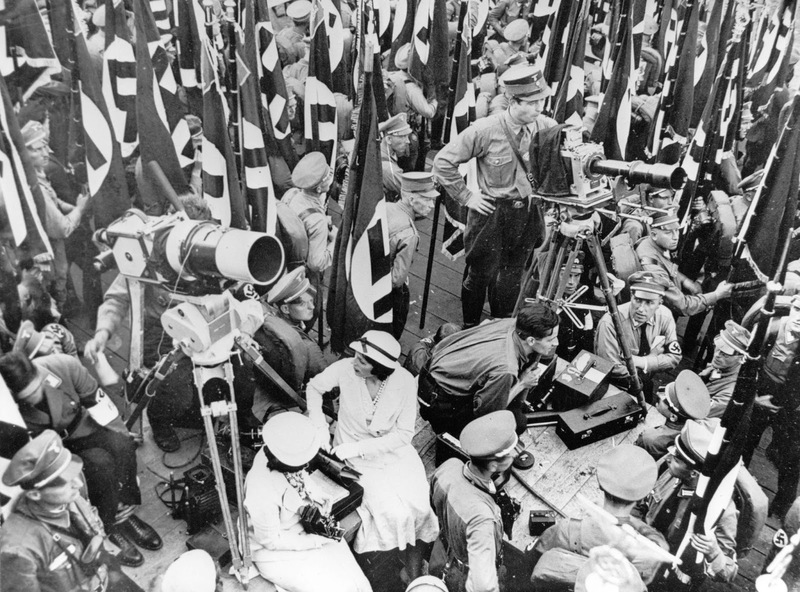 The propagandist had tried to convince Britain that Hitler did not like reviving war hatreds, while in Germany militarist propaganda of all sorts was being spread everywhere by films, parades, speeches and the press. It has not only been during Hitler's regime that the German propagandists have sought to have it both ways. Inside Germany they assiduously cultivated discontent with the peace treaty and urged a stronger army, while abroad they argued that Germany had no desire to stir up trouble and yearned only for general disarmament. The French lately have been much concerned about national propaganda, in which they think the Germans have outdone them. A propaganda section was recently established in the Foreign Office, charged with the duty of making known French views on current happenings. Numerous reports that a certain anti-French sentiment was growing up in America—attributable, they said, to German propaganda and to American displeasure at the failure to pay the last installment on the war debt. Short of inducing the Parliament to pay what was owed, what could be done to soothe American feelings? It was suggested in newspapers and speeches that the French point of view could be explained to America; that the Foreign Legion, the subject of unflattering books, should be defended; that French political parties ought to be supported by propaganda, that more French lecturers should be sent to American universities; that the concierge at the Sorbonne should be more polite to American visitors desiring to see that institution. "Mussolini overcame the hostile prejudices of Anglo-Saxon liberalism and of the American democracy, not by giving the reasons for his dictatorship, but by showing the material progress of Italy," wrote Lucien Romier, who then argued that France should more effectively reinforce the work of her official representatives abroad. "We must not proclaim that France is disarmed while at the same time we send out photographs of military parades and dispatches indicating that we launch a submarine every week." "We need an organization to give to the American public the necessary elements of information," said Professor Raoul Blanchard. "First of all, we need an intelligent man who will utilize personal relations in France and in America, who will establish close contact with correspondents of American newspapers in Paris and with people on the other side. Let us also make the American point of view known to the French. We might send a talented Frenchman to make a lecture tour in America to counteract the methodical campaigns organized there regularly by distinguished Germans. In any case, let us do something." It is rare that newspapers or magazines are censored or suppressed in France, but it does happen. A recent issue of an American weekly was confiscated by order of the French Government because it published an uncomplimentary and, it was said, inaccurate article on the French Foreign Legion. The most notable example of British propaganda in recent years was the remarkably successful campaign, begun when the pound sterling went off gold, to convince the British public that the gold standard was not nearly so important as it had been thought. It was a campaign designed, above all, to strengthen public confidence in the government and the country and to reassure those who had been alarmed by the suspension of gold payments. Its object was to persuade British subjects and foreigners that the departure from gold was not the tragedy some believed it would be, and that the pound sterling was—as the Chancellor of the Exchequer recently asserted—actually more stable than gold. This comforting argument gradually developed into a propaganda against a return to the gold standard, which would deprive British industry of the advantage in international markets that the devaluation of the pound had (at least theoretically) given it. Once having convinced themselves that it was a wise and useful action to quit the gold standard, many British readily concluded that it would be foolish to return to it; and when the government gets ready to return to gold—as it may within a few years—it will have to reverse its propaganda and set about explaining to the country that the gold standard has again become desirable. Such reversals can be made by skillful propagandists. For example, the British Conservatives overthrew the Labor Government and denounced it before the country for the sin of letting England be driven off gold; then, within a few weeks, having got the power and being unable to return to gold, they proved to the satisfaction of the majority of voters that going off gold was a good thing for England. They pilloried the Labor Government for letting the budget get unbalanced, but lately some of them have urged that the budget now be deliberately unbalanced so as to bring about an inflation of credit by new bond issues. These achievements are possible, even easy, when the State or a dominant group within it has the machinery of propaganda at its disposal. 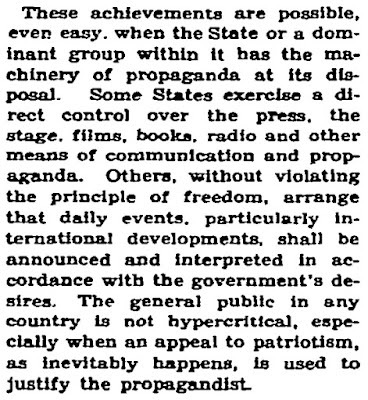 Some States exercise a direct control over the press, the stage, films, books, radio and other means of communication and propaganda. Others, without violating the principle of freedom, arrange that daily events, particularly international developments, shall be announced in accordance with the government's desires. The general public in any country is not hypercritical, especially when an appeal to patriotism, as often happens, is used to justify the propagandist.